Photo submitted by Mike Morris, 1977-79 Spirit of Atlanta alum and step-dad of 2006 Spirit member Will Woods. 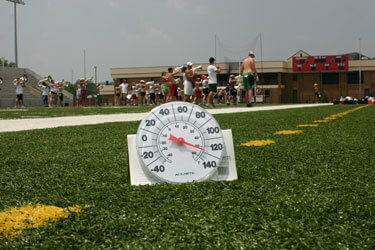 This photo was taken on Memorial Day as Spirit's 2006 horn line learned drill on a very hot Alabama afternoon. Highs reached the mid-90s, and the temperature on the turf at Jacksonville State University's Paul Snow Stadium approached 130 degrees.